We take it you are in the market for a new adventure shelter? We understand it’s hard to choose with over a hundred options and endless brands trying to win you over with their new, techy tent. Well look no further, we researched, tried, and tested the best tents for camping on the market today. We’re going to show you exactly what features and factors you need to pay attention to so you can buy 2018's best camping tent that satisfies all your adventure needs. 96 x 120 x 72"
108 x 192 x 72"
80.7 x 78.7 x 47"
**Below, you'll find our detailed reviews, but you can also click the links above to quickly check the prices of our top 3 picks for the best camping tents in 2018. Typically the best camping tents are bigger than their backpacking tent counterparts so you will find them a bit more livable. They are designed to provide more space since campers will be spending a significant amount of time in their tents both day and night. Tent height is typically an apt measure for livability and will save tall campers from a trip to the chiropractor. At the end of the day you shouldn’t think of it as a shelter but as more of a little vacation cottage made up of mesh, tarp, and tent poles. You should have ample space to nap, read, stand up, stretch, and hide from swarms of mosquitoes. Ventilation is the second measure for quality tents, especially when you are camping in sweltering heat. Big windows, multiple doors and tent walls made with mesh will combat that greenhouse effect that plague many camping tents. If you are camping in the rain, snow, or any other kind of adverse weather you want to make sure that your camping tent is up to par. The best outdoor weather proof tents have tarp like rainflyes, weather sealed seams and tent floors are made with artfully placed mesh to release moisture (aka sweat). Most tents are made with either polyester, nylon or a combination of both since these materials are breathable and lightweight. But there are a few notable differences between these fabrics. Nylon is the cheaper and lighter option. While polyester is a bit tougher and it even offers ultraviolet resistance (blocks sunlight so you won’t get a gnarly sunburn while napping in your tent). Your tent’s seams are also an important feature to consider. The best rated camping tents will have double stitched or folded seams to keep water from leaking through. Most of all, make sure that the tent floor is raised on the sides and is made of one continuous piece of material, so it keeps water, dirt and creepy critters out. Additionally, the top rated camping tents have thick material on the bottom to make sure sharp pebbles and sticks don’t poke clean through the fabric. If your tent lacks proper, water tight stitches or the tape is starting to peel it is good to remember that a little DIY tinkering can go a long way and fortify your tent against adverse weather. Gear Aid puts on an easy, and simple tutorial about how to re-seal your tent seams. First you remove the tape, clean the area with rubbing alcohol, outline the seam with scotch tape so the sealant doesn't get everywhere. Then use the brush tip applicator in a thin, measured layer. Do this to all of the seams in sections. Finally, let it all dry for half an hour and then you are ready to face some torrential storms! If you are running away to the wilderness after a long week of work, the last thing you want is a complicated tent that takes 45 minutes to figure out and you spend the entire weekend convinced that there is a tent pole missing. Luckily, the tent gods have heard our cry and easy-up tents take the work and puzzle solving out of tent assembly. With these tents all you have to do is unfold the tent, spread out the fabric, extend the poles, and click and lock. They can usually be set up in less than 120 seconds, even if it is your first time using it. So the only thing easier is rolling out your bag and sleeping in the open. While camping tents are more spacious than other tents, it is possible to take ﻿﻿﻿﻿﻿﻿﻿them﻿﻿﻿﻿ ﻿﻿﻿on the trail backpacking. It just means extra weight, which some people aren’t down with. So you must keep in mind what is the right balance of weight and size. Number of occupants will dictate what tent you want to buy. If you are camping alone, then a two-person tent will be sufficient to house yourself and all of your gear. If you typically do family car camping or hike in a group of 5, then a six or 7 person tent will suffice (if you don’t have a bunch of gear). Trying to squeeze two people in a 2-person tent will leave you without sufficient space to store your gear. The general rule is that you should get a tent that accommodates one or two more bodies than you need. On the other hand if you are a solo camper 99.99% of the time, than a bigger five person tent will be harder for you to warm up and also just a waste of space and weight, because the higher the occupant capacity, the heavier the tent is going to be. 120 x 120 x 72"
96 x 84 x 59"
202 x 96 x 66"
The Core 9 Person Extended Dome Tent is a massive shelter that sleeps nine people and could even fit 3 queen sized mattresses. Its center height is 72 in. 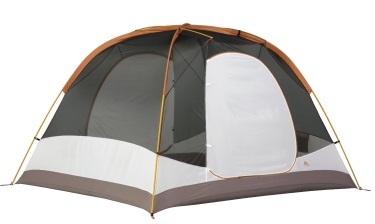 (6ft) so this tent is truly made for hikers of all shapes and sizes. The included lantern hook, gear loft and organizer pockets make it convenient to store snacks, lights and books. It also boasts an electrical cord access port that is fully closable when you aren’t using the feature. Water repellent fabrics with active bead technology boast faster water runoff paired with sealed seams and rain-resistant door/window seals. Finally, the fully-taped rainfly is removable in warmer weather so you can see through the mesh ceiling and windows for a panoramic view. At 20 pounds, this is a heavy tent that might fill up your whole backpack if you take it on the trail. 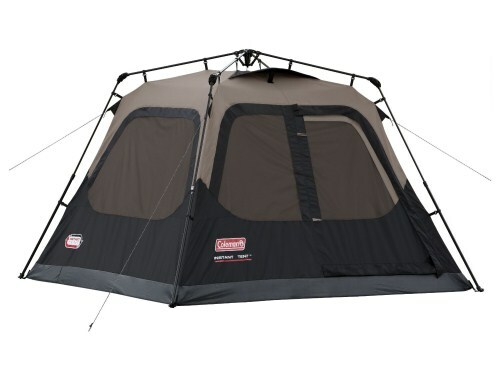 The Coleman Sundome Tent is a polyester dome shelter that sleep 6 people. The entrance is quite large, which makes it way easier to step in as opposed to crawling in. It is extremely spacious, with the roof of the tent reaching 72” (aka 6ft). The 8.5 mm fiberglass poles are hardy against strong winds, and the bath tub style 1000D polyethylene floor is tough against mud and rain and rises up high on the sides to prevent debris from getting in. Additionally, the floors have welded seams, a hooded fly, along with a mesh window and roof vents that provide proper ventilation even in rain, so you can avoid that dreaded humidity buildup. The strong fiberglass poles conveniently clip in and are fed through continuous sleeves, which make it as easy as possible to insert poles without accidentally jabbing your fellow camper, or worse, punching a hole in the mesh. Then lastly, there is a hook at the top to attach an LED light or fan. 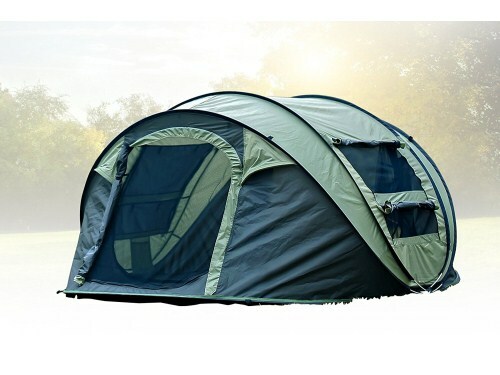 The Coleman 4 Person Instant Cabin is a single door tent that is made using a smart one-piece design. It is equipped with poles that come pre-attached to the tent that unfold, extend and secure in just a few minutes. Which means assembly is so simple and it is impossible to lose parts and pieces. 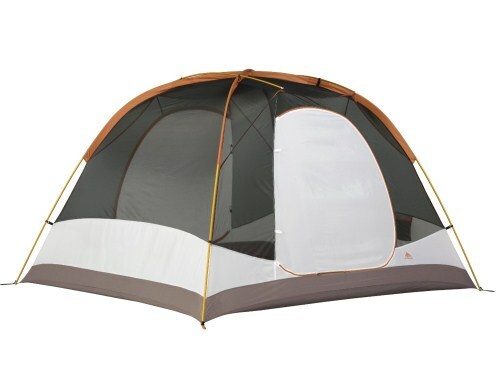 Since this tent is made of heavy-duty 150D polyester taffeta it is fully equipped for all four seasons. Also, the WeatherTec system, inverted seams and patented welded floor will keep you dry while the integrated vented rainfly promotes some necessary airflow. There are two storage pockets to keep trinkets and tools in. Also, the tent’s expandable carry bag makes it so easy to shove that tent back into it’s case when the adventure is over. If it rains, inside there's enough room to stretch out on a queen-sized airbed, and two storage pockets help to keep small items organized. When it's time to head home, the tent easily packs up into an expandable carry bag with a rip strip until you're off on your next adventure. The Big Agnes Flying Diamond 6 is a bonafide four season mesh and polyester cabin. This 5 ft 6 in. deluxe car camping/base camp tent has two vestibules with two D-shaped doors on the tent body for a seamless entry and exit. DAC combination lightweight aluminum poles with press fit connectors, make it quite durable without the extra weight. Then the tent body is constructed with breathable polyester ripstop, with customizable nylon mesh windows, and the fly and tent floor is made with durable 1500mm waterproof polyurethane coating. Additionally, the front vestibule door has vertical zippers which may be stretched and staked out as a shade using extra stakes (or trekking poles). Reflective strips line the pole insertion loops for easier nighttime setup and plenty of mesh storage pockets offer storage for nicks and knacks. At 5 ft 6 in. this tent will only allow some to stand, most likely with their heads grazing the top. The FiveJoy Instant 4-Person Pop Up Dome Tent boasts a stress free setup system (aka it springs out of the bad and assembles itself. That means no more messing with unyielding tent poles! The double doors flanking each side peel back to offer stellar views, but even more so, offer easier access and escape from your temporary mesh home. Then the opaque mesh windows mean this tent is going to catch all those lovely breezes and cool you down after a long day of adventuring. You can store your keys, phone or emergency granola bar within convenient reach using the numerous storage pockets.Then there is a lantern hook on the tent roof to you can stay up all night playing cards. Finally, this tent has guy lines that turn windows into a makeshift rainfly for light (emphasis on light) showers which also block that strong afternoon sun. This tent literally pops out of the bag and assembles itself-- so it is even more efficient than easy up tents! 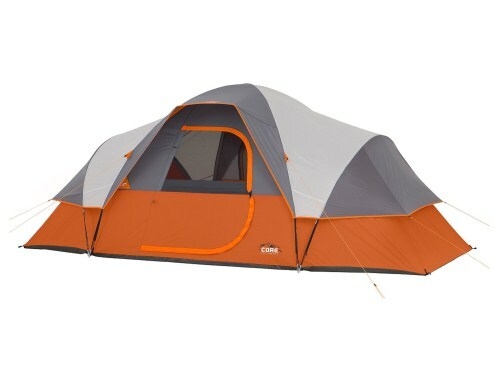 The Kelty Trail Ridge 6 Person Tent is a spacious stunner. It is essentially a two room tent with it’s mirror image vestibules flanking the exit and entrance. Then the taut multi- diameter pole configuration keeps the walls steep and upright for shucking off rain and debris, which the aggressive arch towards the top increases standing space, making this a livable tent (especially for taller folk). The packaged weight is 13 lbs. Other features include mesh wall panels for breathability and ventilation, ArcEdge taped floor seams for extra fortified weather sealant, continuous pole-sleeve construction for secure and easy assembly. Additionally, it has internal storage pockets for storing those midnight snacks and LED lamps, and noiseless zipper pulls for when you need to go take a pee outside in the middle of the night but don’t want to wake the misses. Als, the waterproof fly keeps the tent and you dry. The rainfly slopes generously outward in the front and back (the door areas). This ensures that all rainwater is deposited 6-12 inches away from the well-sealed floor seams of the main tent. 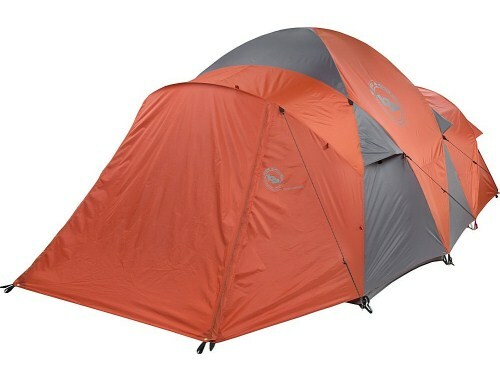 The best camping tent of 2018 is the Kelty Trail Ridge 6 Person Tent! 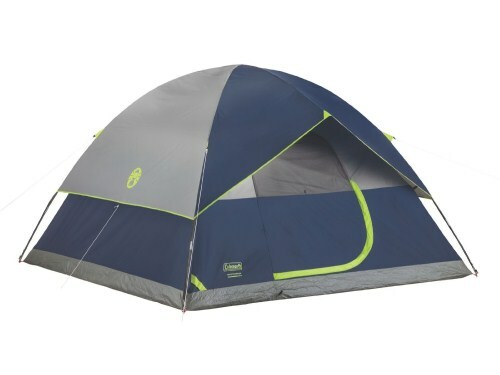 It is equipped with everything your adventurous heart could desire— a vented stargazing fly, 2 doors and 2 vestibules for easy entrance and escape, thorough seam-taped construction to prevent leakage, gear loft loops, a footprint to protect the tent floor, plenty of internal storage pockets. Then finally, out of every tent on this list, at 13 pounds this accommodates the most people for the least amount of weight which makes it dually perfect for car camping and backpacking.